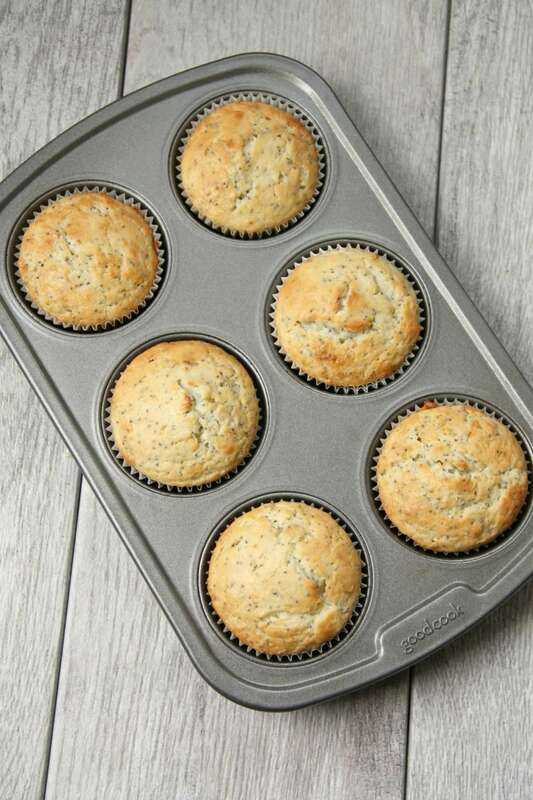 These lemon poppyseed muffins are lemony muffin perfection! They are sweet and moist with a nice punch of lemony goodness. My family pretty much inhaled these delicious muffins! They taste awesome plain, but these muffins are taken to the next level with a delicious and lemony glaze. Everything is better with glaze, right!? One warning! Please read the recipe carefully and don’t confuse the lemon extract and lemon juice. They are different and you only need a tiny bit of lemon extract because it is lemon oil and it’s very powerful stuff. Preheat oven to 375 degrees and add muffin liners to a muffin tin, set aside. In a large bowl cream together butter and sugar. Add the eggs and combine. Mix in lemon extract, lemon zest, lemon juice and greek yogurt. Add dry ingredients to wet ingredients and mix until just combined. Fold in poppyseeds. Fill muffin tins about ⅔ full with muffin batter. Bake for 12-15 minutes until an inserted toothpick comes out clean. Cool on a wire rack. To make the icing whisk together the powdered sugar and lemon juice. Drizzle glaze over cooled muffins.